FARGO, N.D. — A late rally fell short on Wednesday night as the RedHawks fell 7-3 in the rubber against the Sioux City Explorers at Newman Outdoor Field. Devan Ahart had three hits and a solo home run for Fargo-Moorhead in the loss. The Explorers jumped out to a 5-0 lead after four and a half innings before the RedHawks were able to get on the board. 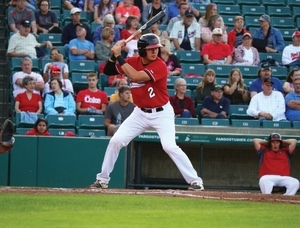 Sioux City put together 15 hits over four innings (third-sixth) to score six runs off RedHawks starter Brandon Barker. Barker got the loss after giving up said six runs on 13 hits over 6.0 innings of work. Barker falls to 2-5 on the year with a 4.82 ERA in 56 innings of work. Ahart opened the RedHawks’ scoring account in the fifth inning with a homer — his tenth of the season — over the right field fence to narrow the Explorers’ lead to four runs. Sioux City added runs in the sixth and eighth innings to take a 7-3 lead it wouldn’t relinquish. The RedHawks will travel to Gary for a doubleheader tomorrow night at U.S. Steel Yard. The first of two seven-inning games will begin at 5 PM.